Amid so many releases of Renaissance music, it is refreshing to encounter this collection of secular medieval songs, some of which are over eight hundred years old. 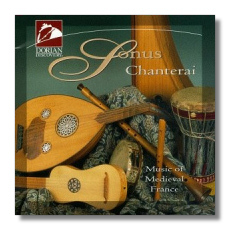 Five vocal works are mixed between eight instrumental works done with ancient instruments like shawms, ouds, and gemshorns. Vocalist Hazel Ketchum has a melancholic soprano voice that seems right for this music, which is sung in the original old French. One song, "Non es meravelha s'eu chan" by the 12th century Bernard de Ventadorn, tells of the delicious pain of surrendering to love. It is strictly monophonic in style. Although no tempo markings exist from that time, Ms. Ketchum sings it at the pace of sacred plainchant, complete with lugubrious tempo and slow deliberate melismas. Another piece, "Chanterai pour mon coraige," is also sung with a similar lazy tempo, punctuated only with a lively choral section. While undoubtedly authentic, I question whether both of these long excursions should be on the same disc. The other three vocal works are more harmonically varied, some even approaching the polyphonic splendor of the Renaissance. A few are accompanied by stringed instruments, yet they are engineered so subtly the effect is almost a cappella. The instrumental pieces are the real strength of this disc. They succeed in evoking a time in which music soothed the fears of provisional life, and contributed to the art of a time that, while musically simpler, had to have been more entrancing than our own.